Happy Birthday! Hope your birthday reading is excellent! Trish - The audio is so good, I just can't imagine reading this book! Happy Birthday, JoAnn! Hope you have a lovely day of reading. Joy - Thanks. I'm having a very relaxing day! You go, girl! Happy, happy birthday. Adding my birthday wishes, and I hope today brings you some wonderful books! I keep bringing books home from the library, and then ignoring them in favor of my TBR shelves. But library books add some diversity to my reading that I don't want to give up, so I need to figure out a better system of reserving and actually reading. Lisa - Thanks for the birthday wishes. I'm not ready to give up the library either... guess it's all about balance. Happy birthday, JoAnn! Hope this is the beginning of a great year! I am finishing up the audio of Reign of Madness. I have a couple waiting in the wings, but I think I might get the audio of Cooked by Michael Pollan, on your recommendation. Thanks, Col. Hope you enjoy listening to Cooked! Happy birthday Princess JoAnn! I'll be calling you that from now on ;) It's a great idea to read whatever you're in the mood for!! Ahhh, there's nothing better. Happy birthday! Hope it's fantastic. Nice idea, to read something you choose yourself. I have a few library books I want to get to, too. Enjoy and have a happy birthday! Happy Birthday! Hope you spent the day exactly as you wished! Colleen - Thanks... that's exactly what I did! Happy Birthday, JoAnn! You are officially sharing your birthday with the new prince! Happy reading! I got through about 10% of The Good House on audio and got bored with it :( It just wasn't working for me but it could very well have been my cruddy mood. Ti - Mood definitely effects my reaction to a book, but I am loving this narration of Hildy's story so much that I can't even imagine reading this one. Happy Birthday to JoAnn! We love you so! Marie - I'll get back to Hotel du Lac later today or tomorrow... just wasn't in the mood for that type of book yesterday. Happy Happy Birthday!!! Yay! You love The Good House!! Isn't Mary Beth fantastic??? I could easily listen to this one again!! Good for you in returning the stack and starting over. I hate it when all of my holds come in at the same time because then I put this weird pressure on myself to get the all read!! Hope you day was amazing! Staci - I'm so glad I took your advice and listened to The Good House. What a fantastic narration! Happiest of birthdays and many happy returns! 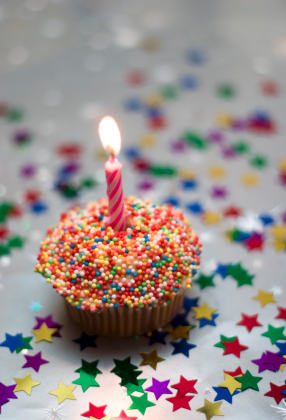 I hope you have a wonderful birthday - and plenty of bookish treats! Vicki - I had a perfect day, complete with plenty of reading time! Yes, the Dinner is weird, isn't it? Iris - Yes, The Dinner is one strange book. I felt slightly off center the whole time I was reading it. Thanks for the birthday wishes. Happy Belated birthday! I think mood does affect how much I enjoy a book. I checked out The Good House awhile ago, but wasn't in the mood for it. I'm glad you are enjoying it. Pat - Thank you! The Good House is definitely striking me now... not sure how I would react in print, but I'm loving the audio. I hope you had the happiest of birthdays! Here's to another year of wonderful reading! Belated Happy Birthday wishes! 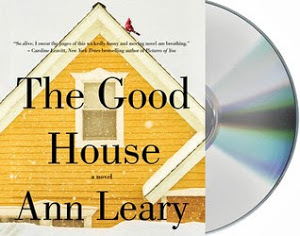 The Good House (audio) is on my 2013 Favorites list. One of my all-time favorite audiobook performances. Mary - I finished the book last night. Not only will The Good House be a 2013 favorite, it is an all-time favorite audiobook performance for me, too. I cannot imagine simply reading this book! Happy Belated Birthday! I totally didn't realize the date of 7/22 - I usually try to make a pie for PI APPROXIMATION DAY (which might end up being linked to you in my mind forever...) but it slipped my brain and now I'm sad. Even though I have made 3 diff pies in the last 24 hours. Our book club just chose Where'd You Go, Bernadette? I hope it is as good as everyone is saying. I have been so disappointed in our club's choices lately that I'm thinking of going renegade and starting another club! I enjoyed Where'd You Go Bernadette? but didn't love it. It's fun though. There's still so much I don't know about my library but the idea of suspended holds is such a great one! I have a book out now that I keep renewing and probably still won't get to it and wonder if I'll even be allowed to check it out again one day (I can't renew it again). Trish - I'm glad to see you back! Birthdays do seem to drag on in my family, so we were still celebrating last weekend. It's almost like a festival or something. I've heard really good things about The Good House. Sounds like the one I'll want to look for on audio. Lisa - The Good House will definitely be one of my favorite audios this year! I know I'm so very late, but HAPPY BIRTHDAY anyway :) I hope it was fantastic. Thanks, Stacy. I had a wonderful day! Happy Belated Birthday, JoAnn! I hope it was wonderful. I'm just about finished with The Good House and I have to thank you and Staci for pointing me in its direction! Yes, Mary Beth Hurt isHildy Good! My goodness. The suspense is about to kill me. I'm at the part where Hildy is in the cellar with Peter. Talk about a psychological thriller. I can't wait to see how it ends. I've also enjoyed the humor. I shouldn't laugh about Hildy's drinking, but Mary Beth Hurt's voice and sarcasm is hilarious. So... thank you for the recommendation! BTW, I actually quit after a few chapters. I was bored and didn't like MBH's narration. I decided to give it another try and I'm so glad I did! Les - Thanks, it was an excellent birthday this year. I'm SO glad you gave The Good House another chance. It's got to be one of my favorite narrations ever!! Still haven't posted about it though... don't know how I could do justice to such a wonderful production.